Rafael “Ralph” Gonzales, 72, passed away, Sunday, November 11, 2018 in Abilene, Texas. A Funeral Service will be at 2:00 pm on Friday, November 16, 2018 at First Baptist Church in Rochester, Texas, with Rev. Joshua Giddens officiating. Burial will follow in O’Brien Cemetery in O’Brien, Texas under the direction of Haskell Funeral Home, 2 Avenue D. A visitation will be held 5-7 pm on Thursday, November 15,2018 at Haskell Funeral Home. Condolences may be made at www.haskellfuneralhometx.com. Ralph was born March 23, 1946 in Baguette, Texas to Elubarde Gonzales and Susanna Gomez Gonzales. Ralph has worked in agriculture all of his life. He loved relaxing, dancing, and watching television. He was preceded in death by his father and mother, Elubarde and Susanna Gomez Gonzales; brothers, Matt Gonzales, Larry Gonzales, Antonio Gonzales, and Manuel Gonzales; sisters, Inez Olvera, Juanita Gonzales, and Estella Gonzales. 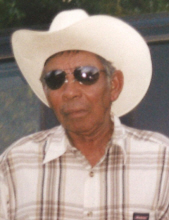 Ralph is survived by his daughters, Susana Luna (Jerry), Elizabeth Gonzales, Sara Moreno (Alex), all of Beeville, Texas, Rachel Montelongo (Juan Jose) of Garland; 10 grandchildren and 6 great-grandchildren; sisters, Tomasa Villanueva, Carlotta Hernandez, Christina Diaz, Soyla Magana, and Sylvia Gonzales; brothers, Jesse Gonzales, Leo Gonzales; as well as numerous nieces, nephews, and friends. To send flowers or a remembrance gift to the family of Rafael (Ralph) Gonzales, please visit our Tribute Store. "Email Address" would like to share the life celebration of Rafael (Ralph) Gonzales. Click on the "link" to go to share a favorite memory or leave a condolence message for the family.